Young people in Dundee have been kick-starting their careers on a free work placement with BT – and local MSP Joe FitzPatrick was there to help them graduate. The latest Dundee placement was attended by seven young people - Sean Gallacher, Jack McLeod, Lynn Rollo, Jake Purdy, Barry Harper and James Shepherd, all from Dundee, and Robert Hanlon from Newport. 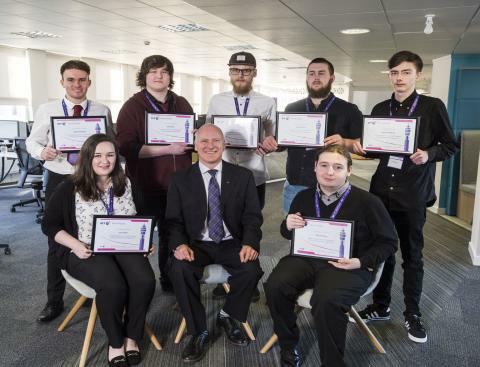 The Dundee West MSP visited BT’s HQ in the city’s Ward Road to help celebrate their success by presenting them with their end-of-course certificates. Seven days of work experience included in the Dundee course were spent shadowing engineers from Openreach, Scotland’s digital network business, as they worked on the city’s fibre and copper communication links. Joe FitzPatrick MSP said: “I was delighted to be asked to present certificates to graduates of BT’s Work Ready Programme in Dundee. This is an excellent project which allows young people to develop skills in a wide range of disciplines with a view to expanding their employment prospects. The Dundee young people had different reasons for taking part in the course, including wanting to get some general work experience before applying for jobs; gaining confidence; doing something positive to increase chances in the jobs market; and learning about engineering with a field engineer. Jake, 19, came to Dundee from his home town of Elgin to study computer games development at Abertay University. He’s currently on a gap year and in the process of changing courses to a different area of computing science. He said: “I’m taking some time out to decide what I want to do and while looking for work I heard about the BT placement. I thought it was something I would enjoy as I’m into computing and was interested in how it works on a national scale. “It’s been even better than I thought it would be. Before, I was not too big on having to deal with people and thought I’d be more suited to a backroom role. Mark Dames, BT’s head of policy and public affairs in Scotland, said: “As a major employer in Dundee, we have a vested interest in helping the city’s young people to be ready for the working life that lies ahead. BT plans to offer further placements in Dundee this summer and anyone interested in attending can register on the website.